Decision Support and Business Intelligence Systems provides the only comprehensive, up-to-date guide to today's revolutionary management support system technologies, and showcases how they can be used for better decision-making. 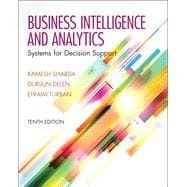 The 10th edition focuses on Business Intelligence (BI) and analytics for enterprise decision support in a more streamlined book. Ramesh Sharda (M.B.A., Ph.D., University of Wisconsin—Madison) is Director of the PhD in Business for Executives Program and Institute for Research in Information Systems (IRIS), ConocoPhillips Chair of Management of Technology, and a Regents Professor of Management Science and Information Systems in the Spears School of Business at Oklahoma State University (OSU). About 200 papers describing his research have been published in major journals, including Operations Research, Management Science, Information Systems Research, Decision Support Systems, and Journal of MIS. He cofounded the AIS SIG on Decision Support Systems and Knowledge Management (SIGDSS). Dr. Sharda serves on several editorial boards, including those of INFORMS Journal on Computing, Decision Support Systems, and ACM Transactions on Management Information Systems. He has authored and edited several text and research books and serves as the co-editor of several book series (Integrated Series in Information Systems, Operations Research/Computer Science Interfaces, and Annals of Information Systems) with Springer. He is also currently serving as the Executive Director of the Teradata University Network. His current research interests are in decision support systems, business analytics, and technologies for managing information overload. Dursun Delen (Ph.D, Oklahoma State University) is the Spears and Patterson Chairs in Business Analytics, Director of Research for the Center for Health Systems Innovation and Professor of Management Science and Information Systems in the Spears School of Business at Oklahoma State University (OSU). Prior to his academic career, he worked for a privately-owned research and consultancy company, Knowledge Based Systems Inc., in College Station, Texas, as a research scientist for five years, during which he led a number of decision support and other information systems related research projects funded by federal agencies, such as DoD, NASA, NIST and DOE. Dr. Delen’s research has appeared in major journals including Decision Support Systems, Communications of the ACM, Computers and Operations Research, Computers in Industry, Journal of Production Operations Management, Artificial Intelligence in Medicine, Expert Systems with Applications, among others. He recently published four textbooks: Advanced Data Mining Techniques with Springer, 2008; Decision Support and Business Intelligence Systems with Prentice Hall, 2010; Business Intelligence: A Managerial Approach, with Prentice Hall, 2010; and Practical Text Mining, with Elsevier, 2012. He is often invited to national and international conferences for keynote addresses on topics related to Data/Text Mining, Business Intelligence, Decision Support Systems, and Knowledge Management. He served as the general co-chair for the 4th International Conference on Network Computing and Advanced Information Management (September 2-4, 2008 in Soul, South Korea), and regularly chairs tracks and mini-tracks at various information systems conferences. He is the associate editor-in-chief for International Journal of Experimental Algorithms, associate editor for International Journal of RF Technologies and Journal of Decision Analytics, and is on the editorial boards of five other technical journals. His research and teaching interests are in data and text mining, decision support systems, knowledge management, business intelligence and enterprise modeling. Efraim Turban (M.B.A., Ph.D., University of California, Berkeley) is a visiting scholar at the Pacific Institute for Information System Management, University of Hawaii. Prior to this, he was on the staff of several universities, including City University of Hong Kong; Lehigh University; Florida International University; California State University, Long Beach; Eastern Illinois University; and the University of Southern California. Dr. Turban is the author of more than 100 refereed papers published in leading journals, such as Management Science, MIS Quarterly, and Decision Support Systems. He is also the author of 20 books, including Electronic Commerce: A Managerial Perspective and Information Technology for Management. He is also a consultant to major corporations worldwide. Dr. Turban’s current areas of interest are Web-based decision support systems, social commerce and collaborative decision making.